Firstly, this site is just packed with info - you may be here for a while, so if you are at work watch out that the boss doesn't come - if he/she does, click the 'Mini Cooper Parking Only' sign above the menu! 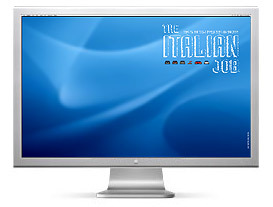 Secondly, The Italian Job team would like to thank everyone who emailed, so they could be notified when the site was launched, unfortunately, due to a catastrophic technical problem the email addresses got deleted! Finally, we're all sorry that you had to wait for such a bloody long time. Although, (here comes the sob story) the laborious task of collecting data on this most magnificent of films was enormous. Also a big thank you goes out to all the enthusiasts around the world who have put up their tributes to The Italian Job in the form of home pages - where a lot of information about the film is available, but we thought it about time that a one stop resource for the film was available. Everything (well almost) you ever wanted to know about the actors, producers, including a detailed section on all the cast members etc... Including a section on the main man Michael Caine. Get that oil pumpin' through your veins with our definitive guide to all the motors used in the film, from the Coopers to the coach, not forgetting the exotic metal aswell. Also get info on all the stunts & the magician himself Remy Julienne. All the odds n' ends connected with The Italian Job - from the charity run to wallpaper. Exposing it's cult status - from TV ads that mimic the film to music videos with more than just a hint of the classic caper. We've scoured the net to find all the goodies that you could ever want, from posters to the elusive soundtrack, a must visit for any fan! Loads of info on the famous Works Minis. Including info on John Cooper, the Monte Carlo Rally and the drivers and their cars that became legends, and made the Mini a legend! There's also info on up-coming Mini events/rallies. 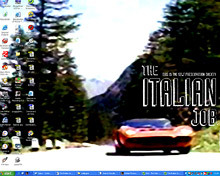 Also, a big plug for 'The Making of The Italian Job' book by Matthew Field, which has proved an invaluable resource to cross check info that we've discovered in the darkest corners of the web. If you wanna buy this book, which we heartily recommend, check out where & how in the Merchandise section. 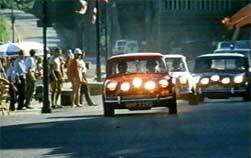 This site is dedicated to Peter Collinson, Director of The Italian Job, who died aged 44 in 1980 - never knowing the cult status that the film gained; and the creator of one of the coolest cars ever seen on the road, John Cooper, who died aged 77, on Sunday 24th December 2000. On Friday 29th April 2011, celebrate the Royal Wedding in a truly British, but alternative way... get a move on and get down to The Red Lion in Hunningham. These guys are taking on a huge project. They've already bought the original number plates of the three Coopers from the film & plan an amazing restoration. They are looking for sponsorship, so get over to their site & get involved. Keep an eye on their site for regularly updated blogs on the restoration project - it's about time someone has done this, and we tip our hats to the guys over at theitalianjobminicoopers.com for getting stuck in. Good luck lads!